If you want to make a positive impression on the people with whom you come in contact throughout your professional life, it's important to follow proper business etiquette tips at all times. The word etiquette refers to the norms and standards for behavior that govern socially acceptable behavior in a given situation. Business etiquette focuses on actions deemed appropriate in professional settings. By getting in the habit of behaving in a manner consistent with the principles related to good business etiquette, you'll be more likely to make an excellent impression on people you encounter on a daily basis. 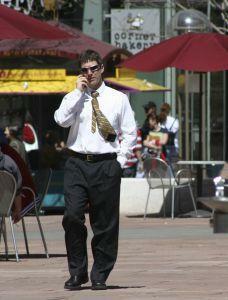 One of the most prevalent etiquette problems in the modern business world is related to cell phone usage. Too frequently, people breach proper business etiquette by leaving their telephones on during meetings; taking calls while in the middle of conversations with clients, co-workers, and even supervisors; carrying on loud cell phone conversations while in office building elevators; and using cell phones in additional inappropriate situations. With the widespread adoption of cell phone usage, many people have lost sight of the fact that the person who is in front of you at a given point in time deserves your full attention. Ignoring or postponing the person who is with you to take a call from someone else is rude, and conveys a general lack of respect. It's also disrespectful and inappropriate to inflict your telephone conversations on other people. If you want to make a positive impression, you should limit your cell phone conversations to times and places where they are not disruptive or intrusive to others. Dressing in a manner appropriate for your company, position, and activities is essential at all times. As a professional, the image you convey sends a message to others about you and the organization you represent. When you dress in an appropriate manner, people are likely to form positive impressions about your abilities and the professionalism of the organization you represent. If your image is less than professional, however, people will assume the same is true about your abilities and actions. Punctuality is an important component of business etiquette. Developing a pattern of being late or getting in the habit of keeping people waiting sends a very unprofessional message. Individuals who have the habit and reputation for punctuality tend to be viewed much more favorably by colleagues, customers, and clients than those who have problems with timeliness. If you want people to view you as a professional, it's important to conduct yourself as a professional at all times. You should avoid using any form of profanity or swearing in business settings or when you are in the company of business associates in other environments. It's also vital to avoid telling off-color jokes of any type. Making inappropriate remarks or using language that is not appropriate in a professional environment sends a negative message about your judgment and professionalism. While there isn't one right way to answer your office or cell phone, there are certainly number of wrong ways to greet callers. When you answer the telephone, it's important to remember that the words you use and the attitude your tone of voice conveys can be the first impression you make on a new contact. Sound professional, positive, and sincere when you answer the phone. Greet the caller, state the name of your company, follow with your name, and conclude by offering to help the caller. In the business world, people often form initial impressions of other people based on their handshake. When you meet a new person, or greet a business associate in a formal setting, it's advisable to extend your hand and offer a firm handshake. Don't lose sight of the fact that the way you conduct yourself is the foundation on which other people form their opinions of you. You can claim to be committed to customer service, but if you don't behave in a manner that conveys respect to your customers, you will not be seen as an effective service provider. You can tell your boss that you're ready for a promotion, but if you don't dress and act the part, you'll never be viewed as management material. The way you behave sends a much stronger message than the words you speak. By adopting and following these basic business etiquette tips, you'll be on your way to making sure that your actions send the right messages to the right people all the time.